Expectations are powerful things. When life goes as we expected we feel good. When people or situations fail to meet our expectations, we are placed in a potentially dangerous situation. Our reactions can have far-reaching impacts. Often our present problems are the result of how we dealt with unmet expectations in the past. Consider for a moment the opening chapters of the Bible. After Adam and Eve sinned, the Lord laid out the consequences in Genesis 3:14-19. We are familiar with them: childbearing would become much more painful, the cursed ground would produce thorns and thistles, etc. Hidden away in these verses is a powerful word from God. God told the serpent, "I will put enmity between you and the woman, and between your offspring and her offspring (seed); he shall bruise your head, and you shall bruise his heel" (Genesis 3:15). The Hebrew word translated "bruise" in this verse means to bruise, crush, or strike. Scholars see it as the first hint of the Savior coming to destroy the enemy. After all, Jesus received a spike through his heels on the cross and his death crushed Satan's power! But that is getting ahead of ourselves. Think about the expectations that Adam and Eve probably had as a result of the promise in Genesis 3:15. They didn't know about the next 1186 chapters of the Bible. They only had Genesis 1-3. They had been kicked out of the Garden and condemned to eating their bread "by the sweat of their brow" for the rest of their lives. As they pondered what God said, it would have been perfectly reasonable for them to expect their yet unconceived child to be the one that would crush the head of that dreadful deceitful serpent. The word "offspring" is singular. They would have had no way of knowing that it would be generations before the Messiah would be born. Their hope would have been in what God was going to do through their child. "Adam knew Eve, his wife, and she conceived..."
Pregnancy is a time of waiting and planning. Dreams and expectations abound. Will it be a boy or a girl? What will they be like? What talents will they have? What color should we paint their room? Of all the dreams and expectations that Adam and Eve had, one would stand above them all: This child shall crush the serpent's head! "...and bore Cain, saying, 'I have gotten a man with the help of the Lord.'" Scholars have long debated the exact translation of Eve's words. Some say the phrase means that she was praising God for giving her a son, Cain. Others say that she is giving thanks to God for his help through the painful delivery. Still others think that she sees something truly miraculous and supernatural in Cain. The phrase can be translated, "I have gotten a man-the Lord!" Whichever interpretation is right, Eve views Cain as a gift from God and undoubtedly sees him as the one who will destroy the serpent. Parents set expectations for their children, whether they are clearly defined or not. The expectations for Cain were high. We don't know how long much time passed, but eventually, Eve got pregnant again and gave birth to another son, Abel. 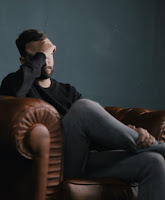 Perhaps we get a glimpse of the expectations they had for Abel when we learn that "Abel" comes from the Hebrew word meaning "vanity or meaningless." The difference in her reactions to the births of Cain and Abel is striking. It is easy to imagine what Cain was like. He had been raised expecting to be victorious. Every step would be filled with confidence because he was Satan's enemy and will defeat him one day. Talk about a first-born son who is going places! Cain labored growing food while Abel tended flocks. "Satan-Crusher" Cain and "Meaningless" Abel both brought a portion of their work and offered it as a sacrifice to the Lord. Then the unthinkable happens: God rejects Cain's sacrifice! His expectations are shattered. The Bible says that Cain was very angry and his countenance fell (Genesis 4:5). 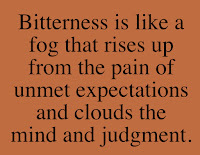 Anger and depression are common reactions to broken expectations. Think about the last time your expectations were not met. How did you react? Some people tend more towards anger and others toward withdrawal and depression. Others oscillate between the two. It is at the moment of broken expectations that sin is crouching at the door desiring to destroy us. This is when we need to hear the two questions that God asked Cain. Question 1: Why are you angry and why has your face fallen? The first question the Lord asks is aimed at getting Cain to define his expectations clearly. The easy answer would be, "You rejected my sacrifice!" The deeper and more important answer would be, "My parents told me that I was going to be a mighty conquerer who would defeat the serpent. I am important! A mighty man! You rejected my sacrifice but accepted the sacrifice of my 'meaningless' brother." Getting at the heart of our expectations is important. Often deeper digging exposes false assumptions, pride, and selfishness. Sometimes it brings to light false formulas that we have built into our ways of thinking. For example, if someone hurts us our despondency may reflect a formula that says, "If I am worthwhile as a person, no one will ever hurt me. Because someone hurt me I must have no value." God's question to Cain was an opportunity for him to talk to God. If Cain had opened up about what was happening inside of him, the Lord could have realigned his false expectations. He could have taught him to walk in joyful obedience. He could have told him that the fulfillment of the promise to crush Satan's head was generations away. He could have taught him that significance comes from walking with God and not being "a mighty man." There could have been a lot of soul surgery and healing done if Cain had responded. But he didn't. In sullen anger, he remained silent. Question 2: If you do what is right, will you not be accepted? There is a right course of action in every situation and it leads to being accepted by God and the lifting up of our countenance. It may be difficult to follow, particularly if anger or despair are dominating our thinking. The right thing may mean forgiving those who do us wrong (Matt 18:21-22) or loving our enemies (Matt 5:43). The pain of unmet expectations may make the right way seem absurd, but it is the only safe way through the situation. For Cain, the difficulty was that the Lord did not accept his grain sacrifice. An animal sacrifice was required. This was what "doing right" involved. Cain would have to go to his brother Abel to obtain an animal to sacrifice. It would be humbling. Doing what God required would involve an internal transformation for Cain. It would bring him into greater submission to the Lord. It would deepen his relationship with his brother. It would break his pride. The result would be a raised countenance, a better family life, and a future of unknown potential because he was walking in obedience to God. Sin desired to have him. The term refers to a lion poised to attack its prey. God warned him of the consequences of not doing what was right. 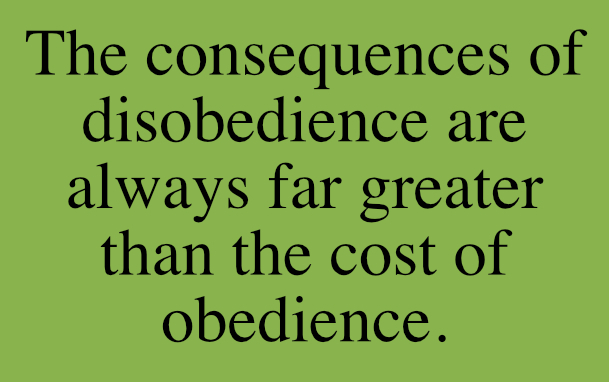 The consequences of disobedience are always far greater than the cost of obedience. Standing there in the fiery trial of unmet expectations, Cain had a decision to make: would he do right or walk away? We know what happened. Cain committed murder. He killed his own brother. Abel had done nothing at all to hurt Cain. The power of unmet expectations caused Cain to see Abel as an enemy worthy of death. As a result of the murder, Cain lived as a marked man away from the presence of the Lord for the rest of his life (Genesis 4:8-16). Oh, how powerful unmet expectations can be! When our expectations are not met and we sense anger or depression (fight or flight) rising up within us, we need to find God's right way through the situation. He will lead us in paths of righteousness for his name's sake (Psalm 23:3). We fool ourselves when we think we can deal with the situation some other way and not suffer the consequences. We may think that we have ignored God's way and are doing well because we have not done something as drastic as Cain did in killing his brother. But murder is not the most common result of unmet expectations. The most common consequence is bitterness. 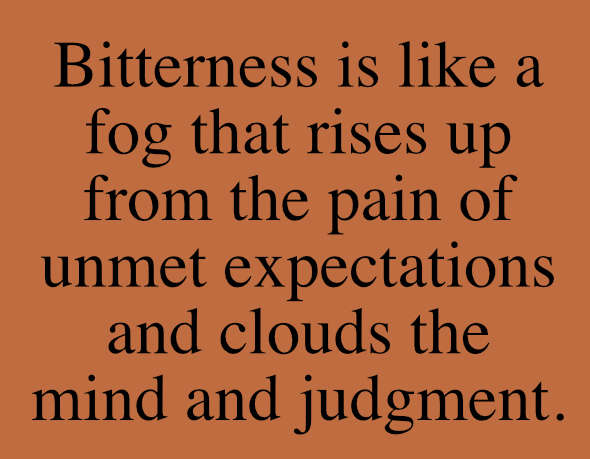 Bitterness is like a fog that rises up from the pain of unmet expectations and clouds the mind and judgment. It causes us to react in anger or despair to things that others would not be bothered by. It poisons life. Like a root buried in the ground, bitterness can constantly send up shoots. The shoots can be cut off, but the bitter root remains. Often it remains masked behind a "tough" exterior and weaves a web of rationalizations for its existence. For the bitter person, there is an underlying sense that life is not fair and that they are perfectly justified in acting the way they do. It makes it difficult to get rid of! That is one reason why we are told to make sure that no one misses the grace of God and that bitter root is allowed to grow because it will defile many people (Hebrews 12:15). We need to allow the Lord to work deep in our hearts to deal with any bitterness. We need to exercise extreme care when we are faced with unrealized expectations because we must choose God's acceptable way or we will suffer the consequences. A great book on dealing with the issue of our soul's health is Soul Care by Rob Reimer. For a detailed study of bitterness read Tracey Bickle's book Chaos Beneath the Shade. Praying Beyond "Lord, Bless the Missionaries"